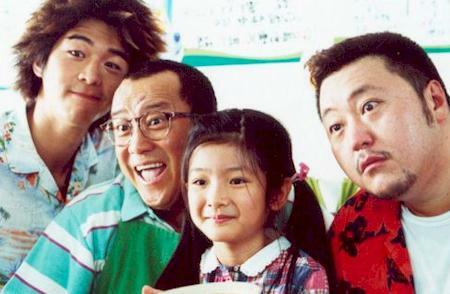 From left to right: Lawrence Chou, Eric Tsang, Yuki Lai and Vincent Kok. The Skinny: Coming-of-age flick which manages to be winning despite a strained first half. The sentiments are nothing new, and the whole film is relatively minor, but the fresh faces and well-observed script make this an amiable pleasure. Merry Go Round is a welcome break from the usual teen tales out of Hong Kong. Not only is it better-observed than most, but it features zippo in the way of ubiquitous popstars. Eric Tsang stars as Mr. Kuk, who opens a noodle shop with son Fung (Lawrence Chou) and daughter Cocoa (Yuki Lai). Despite some initial setbacks (the location is a dump, and the noodles terrible), the Kuk family make a decent show of things. Too bad they're in a lousy location, but who cares about business? What's important here is not the survival of the noodle shop, it's the puppy love plotlines which are thrown in the face of the audience. Fung falls in love with Carlily (Yeung Shing-Lam), who works part-time for Mr. Kuk. Likewise, little Cocoa finds an affinity with Locust (Darren Cheng), a primary school kid who actually likes the shop's noodles. Sadly, love is not so simple. Fung and Carlily fall in young love rather quickly, a point illustrated through a drawn-out "falling in love" montage which plays like a shojo manga Greatest Hits Collection. Still, despite Fung's lightning love for Carlily, he develops a minor attraction to her tomboyish older sister Heman (Zeny Kwok). Heman returns the affection, though equally as reluctantly. Meanwhile, the friendship of Cocoa and Locust putters along with the emotional pull of wheezing jellyfish. One feels left out, the other doesn't notice, and their young friendship hits some minor turbulence. The conflicts and misunderstandings here are simple ones, and sometimes the result is heartbreak and sometimes it isn't. Love grows or dies in alarmingly unnecessary ways; in some ways, it's just like real life, except Eric Tsang plays the father. Notes:  Heavenly Queen Kelly Chen has a small cameo as Fung's ugly-duckling admirer. Also, her brother Victor Chen appears as a cop.